This component is a standard on many snowblower engines. There are several choices if the electric starter needs to be repaired. You can attempt to repair the unit by trouble shooting to find out what is wrong. Or you can just replace the entire component. Home mechanics will find that it is very easy to remove the electric starter motor from the engine housing. Remove 2 or 3 bolts. The sprocket should move out along the shaft easily. If not you need to lubricate this area to ensure that it does move freely. Next you need to make sure that the push button switch is actually making a connection and closing the circuit. Use a volt ohm meter to test it. The next step is to replace the entire module. Order these modules on Amazon. They will ship to your home. You will need the make and model number of your snowblower to order the correct module. Once it arrives, install it on your snow blower engine following the same process you used to remove it in reverse. Trying to start some of the larger snow blower engines using the pull chord is almost impossible unless you have a perfectly tuned engine. The picture on the left is a typical starter motor package for snow blowers. It consists of the motor, a connecting cable and a push button starter terminal, It accepts an electrical extension chord connection. On the motor there is a sprocket that spins out and away from the housing to engage with the engine drive shaft sprocket. 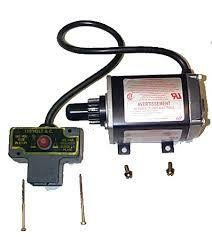 There are many different snowblower starter motor problems that can occur as these devices age and are used. Lets face it the engine is much easier to start with an electric starter compared to a pull chord. As engines get larger, pull chords are even more difficult to use. Unless your engine is tuned perfectly it can be very difficult to start a snow blower engine with a pull chord. Recently the writer found that on his snowblower, the electric starter would spin. But the sprocket would not engage with the engine sprocket. We removed the starter by unscrewing three engine screws and found that the sprocket which is supposed to slide out needed lubrication. The chaft was a bit rusty preventing the sprocket from sliding out. WD40 is a great product. I sprayed the shaft and the sprocket liberally with WD40 and reinstalled the motor. Presto it worked and I was able to start the engine and clear the snow from my driveway. The major problem I had was that I had to do this in freezing temperatures. The good news was that I am handy enough to do this sort of thing on my own. The alternative might have been a $75 to $100 repair bill. Don’t forget transportation costs to get it to the repair shop. I would probably lose the use of the machine for at least a week or longer. Bottom line, this is a maintenance item this summer for me when it is warm. I will also have time to do proper repairs and lubrication. It could have also just as easily been a broken wire, a bad switch on the starter switch or a seized electric motor. You can purchase the entire component online from Amazon as well for a reasonable price and they are relatively easy to install. Can bad spark plug affect snowblower engine performance? The answer is definitely yes. Plugs that are dirty with soot or have an improper gap can affect a snowblower engine in several different ways. They may become difficult to start. When they do start, they may run rough and also use more fuel in the process. You may get a lot of exhaust because of the poorly burned fuel. In some cases when a spark plug is in really bad shape the engine may not start at all making it quite frustrating on those really cold snowy days. If you are having problems of this sort, attend to the problem immediately before your snowblower will not start at all. 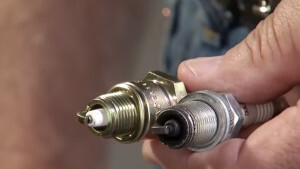 Remove the spark plug using a spark plug removal socket after first disconnecting the spark plug wire from it. Once it is removed, inspect the spark plug for damage. Any damage to the metal of the porcelain should require a new plug to be installed. If you decide to keep the old one, clean all of the soot and deposits off the plug and then reset the gap to the manufacturers specifications. Once this is complete reattach the spark plug wire and hold the plug against the metal housing to properly ground it. 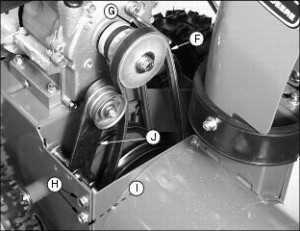 Pull the crank to turn the engine once or twice to confirm adequate spark is being produced. If there is no spark, you may have other problems to deal with other than the spark plug. You may have to do this several times to ensure that you have a spark. Make sure you properly ground the plug against the housing. Reinstall the spark plug in the engine and reattach the spark plug wire. If the engine still will not run smoothly you may have a gummed up carburetor which will require cleaning etc. The answer to the question, what will a bad spark plug do for a snowblower, is nothing good. At the very least, your engine may run rough, be difficult to start and use more fuel than normal. At the very worst it will not stat at all, especially on the coldest day of the year or when you have the most snow. These things just have a habit of occurring at the worst times leaving you to shovel snow or look for help from a neighbor. Your snowblower engine can run rough for other reasons as well such as bad gasoline, a gummed up carburetor and other issues. However one of the easiest things to check first is the condition of your spark plug. The one shown in this picture needs to be clean and reset. It may even need to be replaced if the corrosion is bad once you remove all of the dirt etc. Remove the spark plug while being careful not to dislodge any dirt from around the spark plug area. Disconnect the wire first. You will need to use a spark plug removal tool to unscrew it from the engine. Once it is out, clean it with sand paper and a spark plug cleaning tool. If there are pock marks in the porcelain or you cannot get it to clean up just buy a new one. In both cases you will need to reset the gap according to the manufacturers specifications. While the spark plug is removed you should also verify that it is producing adequate spark. Reattach the spark plug wire and ground the outer metal of the plug against the housing. Crank the engine once or twice to confirm that it is producing a spark. If not you may have other problems to resolve besides replacing or cleaning the spark plug. We discussed options for a tubeless tire repair in our last post. We wanted to spend a few more minutes discussing tubeless tire conversion. This is a viable option for older snow blowers with tubeless tires. It is an inexpensive way to repair the tire and you do not even have to take the tire and rim off the axle. This can be a problem for older snow blowers. We will outline a step by step approach to completing a tubeless tire conversion assuming that you cannot remove the tire and rim from the axle. If you have the rim off the axle, just ignore the appropriate steps. The tire is repaired inexpensively and without waiting for a mechanic. It should be pretty easy to do a tubeless tire repair snowblower, right? Well there is always a complication. To begin with the tire always goes flat when it is really cold outside. If only the tire would go flat in the summer time and you had the presence of mind to repair it then. Another complication is that your snow blower is old and the rim is rusted on to the axle. No matter what you do it will not come off! Even after using penetrating oil, hammering it and trying to get a gear puller on it, nothing works. What can you do to get this fixed? In some cities there are mobile small engine repair mechanics to call on. You may have to load it on to a trailer and take it to a mechanic. While these solutions are viable, they can be expensive and time consuming. There is another answer. Tubeless Tire Repair Snowblower – Install a Tube! If you cannot get the tire and the rim off, there is another approach. Purchase the proper size of tube for your wheel. Pry off one side of the tire from the rim. Install the tube inside the tire and insert the valve into the appropriate spot in the rim. Pry the tire back onto the rim and blow up the tube. Take care to make sure that the rubber tire seats properly on the rim. You may have to massage the tire a bit to get everything to fit. Now you have a tubed tire with a lot less effort and very little cost. If you can clean the rim and the existing tire, reapply glue and then blow up the tire you may be able to keep your tubeless option. When it is cold or you cannot get the rim off the axle, this can be quite difficult to do. Never the less it is another option to a tubeless tire repair. The spark plug in the picture has been partially cleaned. Further readers can tell that it was very dirty and corroded. It probably was not delivering a very good spark to the engine. How to know if a spark plug is bad on a snowblower? In situations such as this the engine will be difficult to start and may also run roughly. These symptoms can also be caused by dirty gas, a dirty carburetor or clogged filters. You really have to solve the problem through a process of elimination. Firstly the easiest one is to check and clean the spark plug first. Don’t forget to set the gap properly each time you clean the spark plug. How to know if a spark plug is bad on a snowblower? Remove the spark plug after first removing the spark plug wire. Next clean it up using medium grit sand paper. If you cannot get all of the grit off, it is sometimes just easier to install a new plug. Make sure that the gap is set properly as well before you test it. The next step is to reconnect the spark plug wire. Hold the plug using gloves with the metal portion touching the side of the metal housing of the engine. Slowly crank the engine and observe if a spark is being generated between the central post of the spark plug and the outer metal housing of the plug. This test will confirm that electricity is being delivered to the plug and it is generating a spark. Reinstall the plug and start the engine. If the engine still does not run smoothly, you may need to clean the carburetor and filters. Before doing so make sure you have gasoline in the tank! This is actually a common problem for many people who have trouble starting their snow blower. They forget to add gasoline! 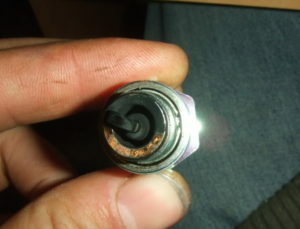 If your snow blower is not running very well it could be because you have a bad spark plug. It could also be due to bad fuel, a dirty carburetor, or even a clogged filter. The only way to really tell how do I know I need a new spark plug for my snowblower is to check. A poor running engine is just the first symptom. Either yourself or a mechanic will need to eliminate the possibilities until you have a smooth running engine. Here is some more information about checking your spark plug. The easiest first step is to actually check the spark plug. If the engine will run, but not smoothly, then you already know that the plug is delivering a spark to the combustion chamber. If it will not run you will need to ensure that electricity is being delivered. 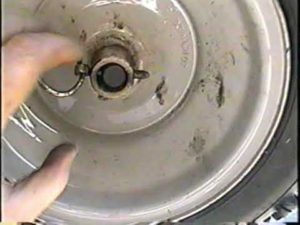 Remove the spark plug after first disengaging the spark plug wire. If the spark plug is dirty and coated with deposits either replace it with a new one or clean the existing one. If the porcelain around the central post is cracked or chipped, replace the plug. Other wise it can probably be cleaned with sand paper. After all of the deposits are removed, set the gap to the recommended gap provided in your manual. Reattach the spark plug wire and ground the outer electrode of the spark plug against the housing. Turn the engine over once or twice by pulling the starter chord. You should see a spark between the central post and the outer housing. If not you may not be getting any electricity to the plug. Once you have confirmed that there is electricity being delivered, re-install the spark plug and try starting the engine following the normal procedure. If it will still not start, remove the plug to see if gasoline is being delivered to the combustion chamber. You should be able to smell it. If not, you will need to clean the filters and possibly the carburetor. If the spark plug is wet, you may have flooded the engine. Wait a few minutes and try again. A poorly running snowblower engine may be difficult to start. When it does start, the engine may run roughly, cough, sputter etc. It also may not run under full power and may not deliver full power. There can be a number of issues that could cause this condition including the spark plug. While all of these could be symptoms of bad snowblower plugs, they can be symptoms of poor gasoline, dirty fuel filters and gummed carburetors. The best way to deal with this problems is by a process of elimination and one of the easiest is to check and clean the spark plug. Remove the spark plug after first disconnection the spark plug wire and moving off to the side. Use an air blower of some kind to blow away any dirt and dust from around the snowblower spark plug. With the proper tool, remove the spark plug and assess the condition of the plug. If it is clean with no carbon deposits, regap the plug and reinsert it. If there are any deposits, they should be removed using sandpaper and then the plug regapped to the specified gap as outlined in the manual. Plugs that are very dirty, with lots of carbon, probably should be replaced. Replace any plug that is in this condition. Often this is all that is needed. If this step does not make your engine run smoother or start, then further checks are necessary. Verify that there is a spark getting to the plug, verify that there is clean gas in the gas tank. Also use some gas line cleaner added to the gas tank.